I hope you know about this story. If not, read on. If so, I hope you’ll think about it in a couple of contexts. First, positive stories about politics in action can be overlooked, quickly lost in the swarm of social media and ever-changing news websites. But tweets, headlines, pictures, even video clips aren’t enough to convey the real and potential impact of this little gem. It unfolded last week during a House Financial Services Committee hearing. The nation’s seven biggest banks came to tell Congress how things are going 10 years after the Great Recession. Turns out things are going well — for banks. 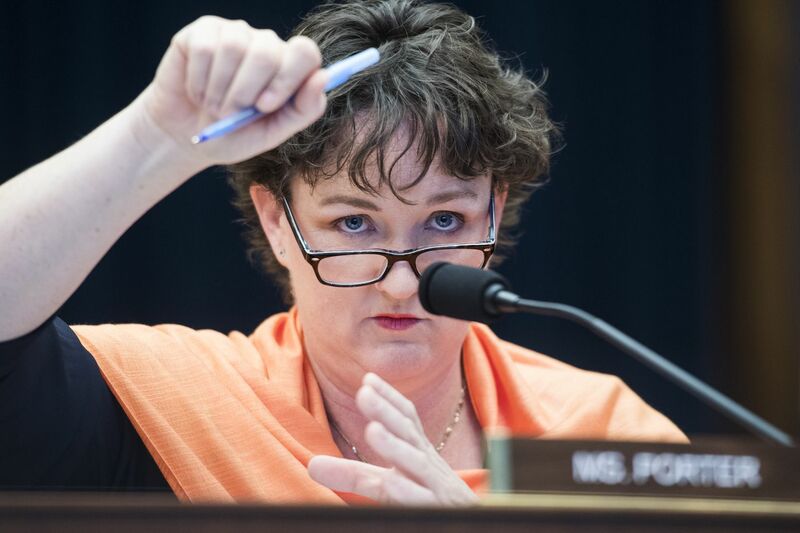 But part of the hearing that struck me was questioning by freshman U.S. Rep. Katie Porter (D., Calif.) of JPMorgan Chase boss (and billionaire) Jamie Dimon. JPMorgan is the nation’s largest bank: $2.6 trillion in assets. Dimon’s salary is $31 million. But when Porter asked questions, she focused on some smaller numbers. She talked about “Patricia,” a full-time jobholder in her district, a single mom working as a teller at a JPMorgan bank in Irvine. Porter laid out the woman’s financial situation: makes $16.50 an hour; takes home $2,425 a month; drives a 2008 minivan; lives in a $1,600-a-month one-bedroom apartment with her 6-year-old daughter. Other monthly expenses include $450 for after-school child care, $100 for utilities, $40 for a Cricket phone, and money for food and gas. Porter showed Dimon how the math adds up, leaving “Patricia” at the end of each month $567 in the red. Porter asked if Dimon would recommend the woman take out a JPMorgan credit card and run a deficit. “I don’t know. I’d have to think about it,” he said. Should the woman overdraft at Dimon’s bank and be charged overdraft fees? “I don’t know. I’d have to think about it,” Dimon said. Porter’s background suggests she knows what she’s talking about. She’s on leave as a professor at the University of California, Irvine Law School specializing in bankruptcy, debt collection, and mortgage foreclosure. In 2012, she oversaw California’s $25 billion bank settlement payouts for fraudulent foreclosures. She’s a Yale grad with a law degree from Harvard, where one of her professors was Elizabeth Warren. And “Patricia?” The Hill reports Porter said “Patricia” is a composite of constituents who contacted her office whose circumstance was drawn, in part, from a Monster.com JPMorgan job listing for a $16.50-an-hour teller in Irvine. Philly-area freshman U.S. Rep. Madeleine Dean (D., Pa.), also a member of the House Financial Services Committee, sat in front of Porter at the hearing. This gets me to the second context I’d invite you to consider regarding this story. It’s not about Inside-the-Beltway politics. It’s a topic impacting the daily lives of average folks. And it suggests that if more members “bring things into human terms” to help people such as “Patricia,” democracy works better and faith in government grows.